This beautiful hand-painted coin cufflink continues a very old art form of a family of artists. The artist carefully selected each coin and choosing from a selection of miniature curved and straight brushes, hand painted every minute detail that already exists in the coin. In painstaking fashion, the artist applies color initially to outline the design, followed by high tempered firing process. The firing process is repeated after each color is applied. The hand-painting process for each piece varies, some taking as long as two days to complete. In the final stage, in order to protect the delicate hand painting, the artist applies and bakes-on a covering of space age plastic, which also adds depth and luster to the item while providing protection forever. Because all of the enamels are mixed by hand at the moment of application, no two pieces are ever exactly identical, making each item truly an original. 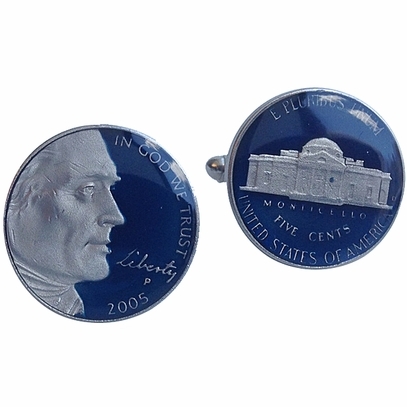 This hand-painted coin is truly a gift or keepsake to be treasured forever. Gift boxed. Hand painted in the U.S.A.